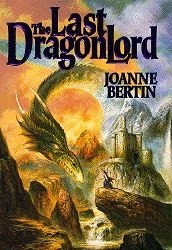 The Last Dragonlord is the opening book of a new fantasy series by Joanne Bertin. Within its pages Linden Rathan, the title character because he is the last of his kind to appear in more than 600 years, joins a contingent of his fellow Dragonlords (very long lived humans who can change into dragons and back again) to decide who shall become the new Regent of Cassori when their Queen dies under mysterious circumstances. There is more than just the standard political intrigue happening, for a group of pure/true humans seeks to eliminate the Dragonlords, starting with the group in Cassori. Of course the fact that there might also finally be a new Dragonlord on the horizon, who is also a potential soul mate for Linden, further complicates matters. In Bertin's debut novel, she wisely changed the name of the secretive group of humans from The Fellowship to The Fraternity. Unfortunately, someone along the way didn't make all the necessary changes, for there are still occurrences of the J.R.R. Tolkien inspired name used within the early pages and on the cover copy. And despite how it is presented on the cover, Dragonlord is only one compound word. Some might say the circumstances that keep Linden and his true love separate until the "proper" time are cliched, but you will find yourself rooting for everything to work out for both the new couple and everyone else involved. Dragonlords/weredragons is definitely a new concept to me. When I came across this book at my local library, I decided to give it a try and found the novel an entertaining read. The characters were believable, although why some members of the Fraternity would want to master dark magic when they're proud of being true/pure humans seemed a contradiction to me. Other than the title species and magic in general, there isn't many of the other fantasy trappings one might expect to find. Not that there's anything wrong in that per se, but your opinion might vary.